Many occupational therapists, both in South Africa and overseas, will learn with sadness of the death of Judith Farrell, recently, in Australia. 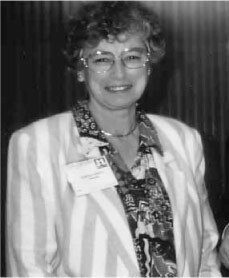 Judith was very well known throughout the occupational therapy world for the work that she did as the secretary of the World Federation of Occupational therapists (WFOT) (1974 - 1980) and as its second Vice President (1980 - 1984). In this capacity she will be remembered for her insight, and ability to assess and solve problems, for her work ethic and the zeal with which she attempted to improve the standards of the profession. To this end she was instrumental in setting up the process for the study conducted by WFOT on the "State of the Profession" world wide. Judith came to South Africa at the invitation of Vona du Toit after Vona had seen the work that Judith was doing in Australia in the field of job analysis and the placement of disabled people in suitable employment. This visit in 1971 was for six months and the purpose was to help set up the Medical Fitness for Work Unit at the HF Verwoerd hospital. Through her research, which showed that savings on disability grants could be made through rehabilitation, she managed to convince the Transvaal Provincial Administration that it was worth supporting this unit. So enthusiastic was Judith about the potential of the work that she was doing in this unit and for South African occupational therapy that she resigned from her job in Australia as the National Director of occupational therapy programmes in the Australian Commonwealth rehabilitation centres and returned to South Africa in 1972 to take up the position of head therapist at the HF Verwoerd Hospital. Judith had initiated the development of a system of job analysis - the Humphries Chart System in Australia; and brought this useful system to South Africa to be used in the Medical Fitness for Work unit. Later she also introduced the Modular Arrangement of Predetermined Time Standards (MODAPTS) to South Africa which was integrated into several of the occupational therapy training courses. It is fair to say that Judith transformed the approach to work rehabilitation in this country. She continued her work in this sphere of practice when as part of her PhD degree she developed a computer system for Basic Motions of Work. After Vona du Toit died Judith became the head of the renamed Vona Du Toit College of Occupational Therapy where she was instrumental in getting that course accepted into the University of Pretoria and changed to a degree course. Judith continued to make an impact on South African occupational therapy through her contribution to the delineation of the different types of occupational therapy support staff as well as their training and she was part of the team that initiated the first formal occupational therapy assistant training at the Pretoria Technical College. Through her membership of the Professional Board for Occupational Therapy she played an important part in the formal acceptance of the three levels of occupational therapy support staff in South Africa. Judith was an inspiring, enthusiastic occupational therapist, a very competent clinician who tackled all that she did with enthusiasm and a desire to do the absolute best. This applied no matter what she did, whether it was cooking, sailing, taking photographs or her construction of temporary prostheses and the training of amputees in the use of their prosthetics. Judith Far-rell's contribution to the profession in South Africa was significant and the things that she initiated last until this day. She was sorely missed in South Africa when she retuned to Australia due to her mother's illness.